With large leaves the size of dinner plate, Ficus dammaropsis is one of the best foliage plants available. Evergreen and reaching up to 10m in height, the large textured foliage makes some of the smaller ficus species that are popular as indoor plants pale in comparison. Foliage is a good deep green with new foliage emerging with a bronze tinge to it. This is a species that will grow well in the garden at least as far south as Melbourne. It is rare in cultivation as it is a little difficult to propagate from cuttings. However it is available and we think it would make an excellent indoor plant with proper care. You can grow Ficus dammaropsis in a container, although it will need to be pruned after a while as it will outgrow all but the largest pots. Start it of in a container surrounded by other plants that require a little shade. 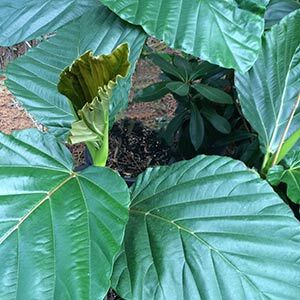 It will give a tropical look to any patio or courtyard and provide shade for smaller plants. Although Ficus dammaropsis is said to grow well in full sun, it may suffer a little leaf burn on very hot days. From our observation, afternoon shade to dappled shade is best. Like most ficus species, a humus rich soil that retains some moisture is best. 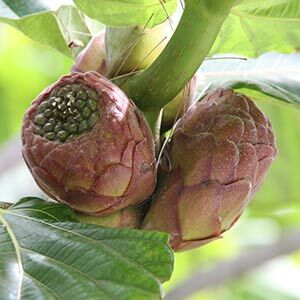 Ficus dammaropsis will cope with dry spells once established, however it will perform better with moisture through summer. Well drained soil that retains some moisture. Full sun in cooler areas, to afternoon shade in areas with hot summers.